We know the value of testing. Generator not only generates the APIs for you but it also generates tests of your APIs to make sure, your APIs are working correctly. 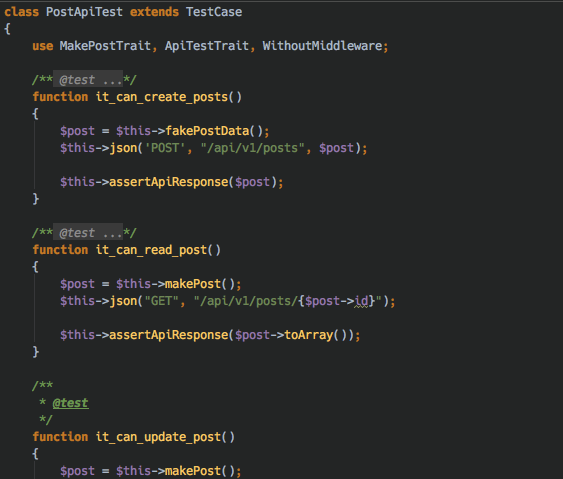 It also generates test cases for your repository methods. 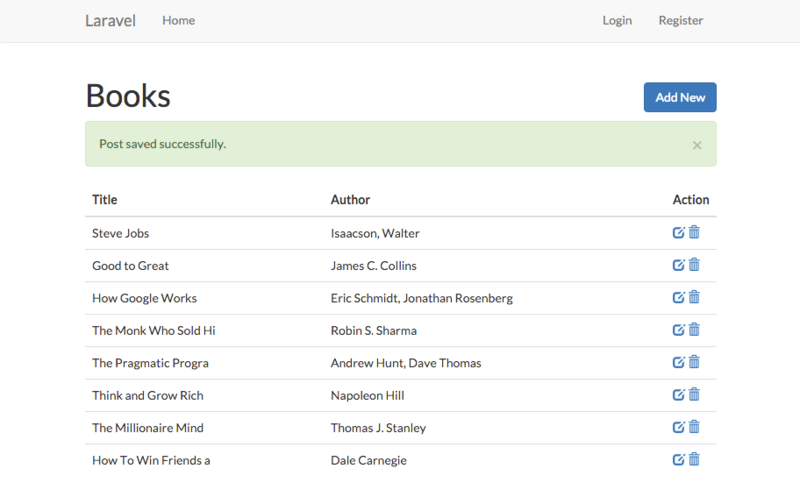 It also enables you to customize the folder path where you want to place your test cases. Just having APIs is not enough. 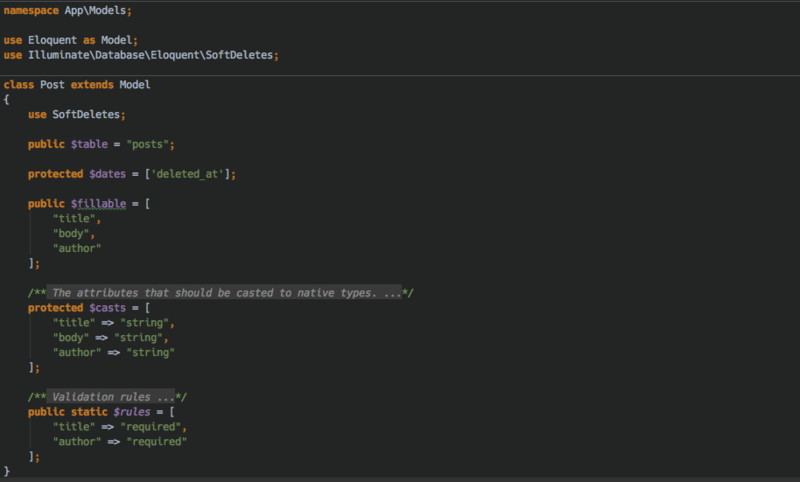 Documentation is also one important element for any API. 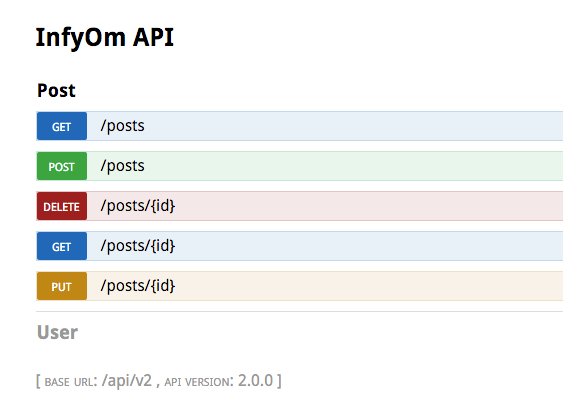 It generates swagger annotations for all your API methods & generates clean documentation for your APIs on the fly while generating your APIs. 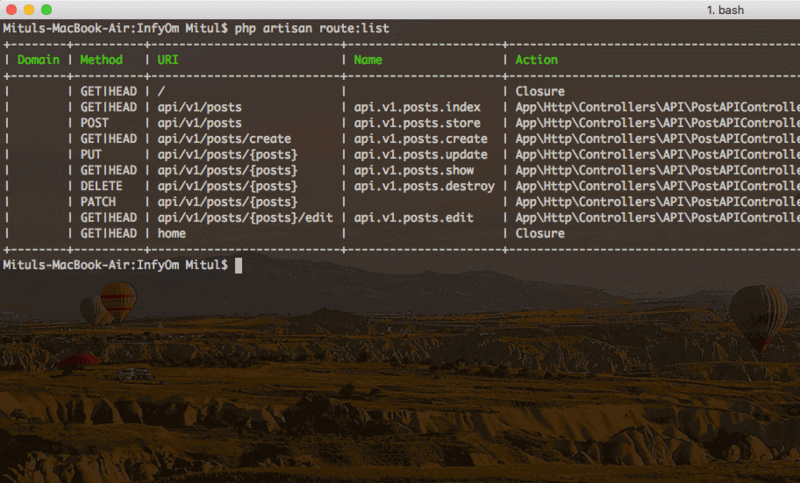 If you have any existing database and want to shift to laravel to make your APIs and CRUDs then you can do it in a minute. It has an ability to generate APIs and CRUDs from any existing database with few or minimal changes. 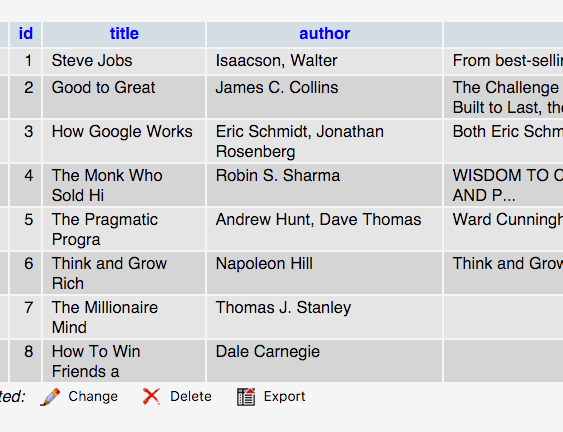 Even it can be generated from your pre-saved schema json files of the generator. 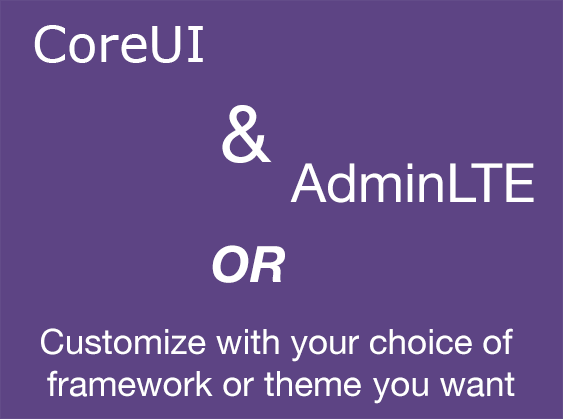 Laravel comes with a full flexibility of choosing your own choice of CSS framework for your templates. Also it has some pre available templates with most popular themes and frameworks like Bootstrap (infyomlabs/core-templates) and AdminLTE (infyomlabs/adminlte-templates). You can even publish templates or can create your own templates as the way you want and with your choice of theme of CSS framework. Generate also comes with visual interface builder which can be used to generate code from GUI interface. Its add-on extension which can be installed optionally. It's also easy to setup with the full customization. Where you can define all details which generally you enter from command line and it generates the same code as command line. You can put a generator builder on your choice of route and with middleware protection, so your application can be secure. InfyOm Generator is a set of tools which generates APIs and CRUD with a bunch of features and customization which helps you to save a lot of time which is generally spent on basic scaffolds and boilerplates with minimizing the chances of defects. 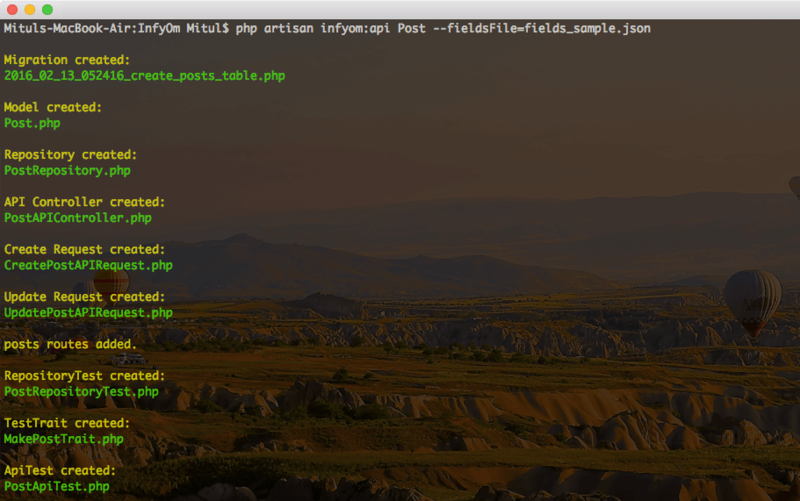 InfyOm Generator has simple general installation steps as any laravel package. Also it has a great documentation which covers all possible customization details and possible options which makes it very easy to use in any of the projects. InfyOm Generator comes with various templates. It supports bootstrap, AdminLTE, Metronic & FlatLab. so you can get started easily with a better theme. Also, you can publish templates and use it with your choice of CSS framework. 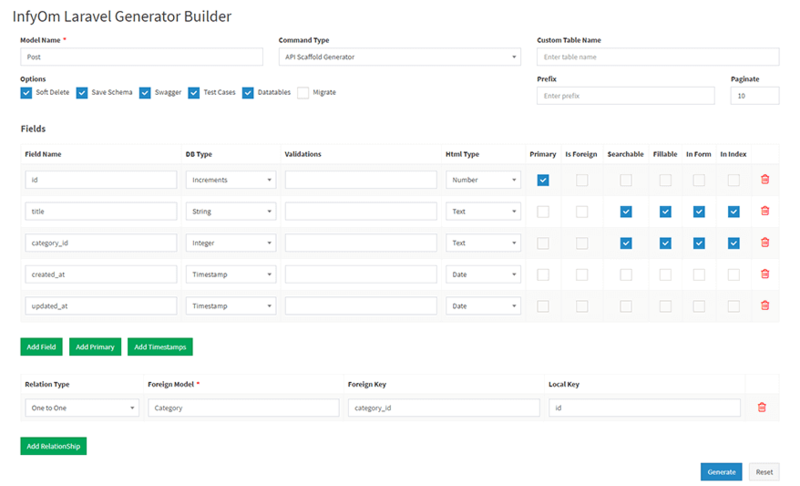 InfyOm Generator also has an ability to publish layout for admin panel and all authentication files which are required for any laravel application. 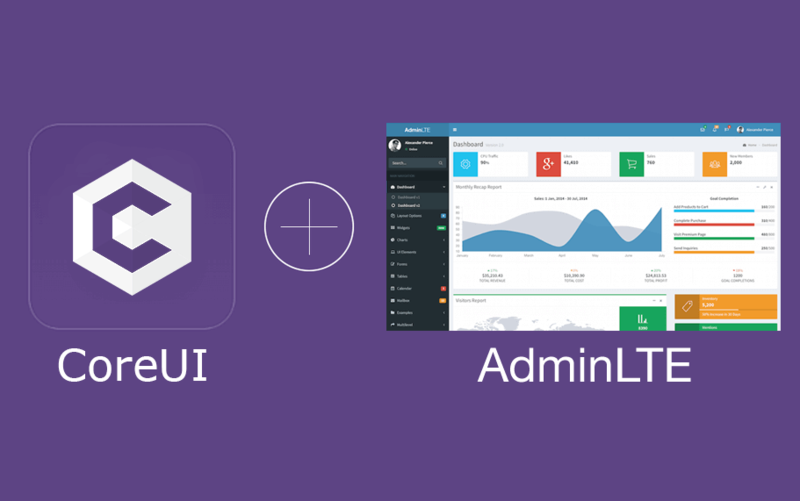 It comes with built in admin panel templates and authentication templates boilerplate. Sometimes you just don't want to generate/re-generate all files but only some of the files in your project. It provides an individual command to generate only the files you need from either entering schema or from the schema file saved before. InfyOm Generator also has GUI Interface in beta which can be used to generate scaffold from real GUI Interface rather than using command line option. Here you can define fields and other required parameter and can generate same CRUD and APIs as command line. We are a group of creative nerds making awesome stuff for Web & Mobile. We just love to contribute to open source technologies. We always try to build something which helps developers to save their time. so they can spend a bit more time with their friends & family. © 2015-2019, InfyOm Technologies .